In the most recent work from Farrar's lab, supported by the National Science Foundation, postdoctoral fellow Linsen Pei [shown above] has employed a new method, velocity map imaging (VMI), to detect reaction products in ion-molecule reactions important in planetary atmospheres. The VMI method is based on mapping the velocities of reaction products onto spatial coordinates by taking a "snapshot" of the products in a short time interval after their formation, and collecting the image on a microchannel plate imaging detector. Because VMI allows all velocity space elements to be observed in a single measurement time interval, the method offers significant advantages over traditional construction of velocity space images in which a given observation time probes only a single product velocity element. In their first publication employing VMI [J. Chem. Phys. 136, 204305 (2012)], Linsen and Jim reported on the reactions of C+ with NH3, demonstrating that C+ may undergo charge transfer with NH3 to form NH3+, in addition to inserting into an N-H bond to form a reactive intermediate that decays to protonated HCN. The images [Figure 1] show velocity maps of NH3+, (left) centered near the tip of the reactant NH3 velocity vector, and HCNH+ (right) reaction products, appearing around the system center of mass velocity. 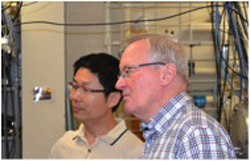 This work was selected as a Research Highlight for the May 28 issue of the Journal of Chemical Physics and as an Editors' Choice for the 2012 year. In subsequent work, the group has applied these imaging methods to the ion-molecule reactions that initiate ion processing in the atmosphere of Saturn's largest moon, Titan. With an atmosphere that is ~97% N2, with CH4 providing the balance, photoionization of nitrogen by solar radiation to form N2+ and N+ initiates ion chemistry. Modeling of Titan's atmosphere with a sequence of reactions that begins with C-N bond formation and charge transfer in collisions of N+ with CH4 and dissociative charge transfer between N2+ and CH4 appears to be consistent with data from the Cassini-Huygens spacecraft mission. Experimental data on the N+ + CH4 system [J. Chem. Phys. 137, 154312 (2012)] are consistent with initial formation of a triplet state intermediate HNCH3+ by insertion of N+ into a C-H bond. This intermediate may decay two ways: by sequential ejection of two hydrogen atoms to form protonated HCN, or by intersystem crossing to a singlet state, and ejection of a hydrogen molecule. The experimental data provide evidence for product formation with up to 10 eV of translational energy, consistent with production of HCNH+ in concert with a hydrogen molecule. The group is now exploiting the multiplex advantage of the VMI method to examine reactions between ions and free radicals, an area of ion chemistry that is virtually unexplored. Most recently, the group has observed charge transfer in the N2+ + CD3 system, showing that CD3+ is formed by electron transfer via a Franck-Condon process, but that CD2+ formed by unimolecular decay of CD3+ appears with substantial kinetic energy release. The results raise a number of interesting questions, including the possibility that the CD3 reactants are formed with substantial vibrational excitation, or that charge transfer to form CD3+ through a strongly bound CD3N2+ intermediate may be highly non-statistical, leading to production of CD2+ fragments with large kinetic energy release. These questions and many others arising in ion-radical collision dynamics are on the agenda for the group in the near future.